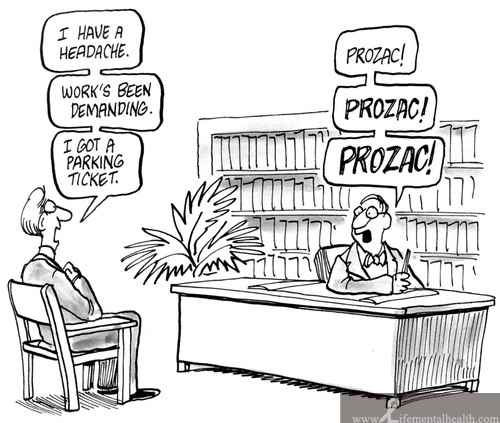 Is energy psychology a cure for a world on Prozac? In the most recent issue of the Psychotherapy Networker, there is a long article on the history of psychoactive medication that I highly recommend you read. For over 100 years pharmaceutical companies have been peddling mind-altering drugs to solve whatever ails people, usually with the blessings of the medical community. We have gone from morphine to cocaine to barbiturates to amphetamines to valium and of course Prozac and the like. The big pharma business in psychoactive drugs is a multi-billion dollar industry that has historically overplayed the benefits of drugs and downplayed the potential pitfalls. I am not saying that these drugs do not have their place. But if you are a therapist like me, you would prefer to help your clients without medications and the myriad of problems that come with them. For over 25 years, I have looked for holistic approaches that do not make clients dependent on medications. The problem is that clients often want to feel better fast. And talking about your problems often does not relieve the intense negative affect we often call anxiety, depression or trauma. Clients want a sense of self-control and self-efficacy. Medication certainly does suppress negative symptoms. But it does not treat anything that is actually creating the symptoms. That is where energy psychology has been such a boon. Instead of a client only talking about his or her problem, the client focuses on the symptoms or specific events that lead to the symptoms and then taps on meridian points (or uses one of several other approaches). Within a few minutes, the intensity of the feelings begins to diminish. Often, different aspects of the problem come to the foreground. For instance, a difference in body sensations occurs, a different distressing thought appears, or another part of the memory emerges. Whatever shows up becomes the next thing we treat. Within a single session we can either totally eliminate the negative emotions associated with a specific event or trigger, or we can substantially reduce those reactions so that the client feels both relief in the moment and hope that more can be done in the next session. Frankly, as the person tasked with helping my client have less suffering, I feel the same things.